Some trees grow from seeds, such as evergreen trees. Other trees need to be grafted, such as is the case for most fruit trees. Grafting is when the part of a stem containing the leaf buds is taken from a fruit tree of one species and attached to the trunk of an established, very young fruit tree of a different species. Both trees must be of the same fruit. In this way, the upper part of the grafted branch becomes the top of a new plant. Trees that grow from seeds start out as tiny seedlings, usually growing directly under the parent tree--the tree that dropped its seeds. Often, those seedlings die because they are blocked from receiving sunlight and moisture. However, seedlings raised in nurseries usually do very well, depending on the species of tree. Grafted trees range in size from a few inches tall to two feet tall. As these trees grow, they often need to be staked for added support. 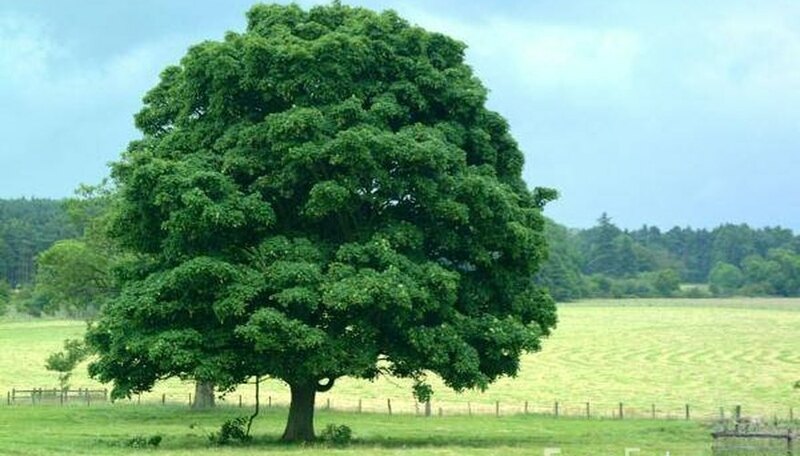 Once a seedling has been planted, it can grow at a slow or fast rate, again depending on the species of tree. For flowering fruit trees, pollination must occur in order for fruit to be produced. Some fruit trees, like apple trees, need to be cross-pollinated. This means that it needs pollen from another tree in order to bear fruit. Other trees, like peach trees, can self-pollinate. As a fruit tree grows, it will create blooms which will attract the bees needed to pollinate it. Soon the blooms will fall off (usually in late spring), and leaves will appear. Fruit will begin to grow where the blooms were. Evergreen trees usually grow straight upward, keeping their arrow-like shape. Deciduous trees, on the other hand, tend to spread out and may need yearly pruning to keep a pleasing and productive shape. In the fall, the leaves of deciduous trees change colors; they become red, orange, yellow, and brown. In early winter, the leaves fall off, and the tree remains bare until spring, when blooms and buds start to form. Once trees are established, they can live a long, healthy life. That's true as long as their minimum water and light needs are met. Trees create their own food through a process called photosynthesis. The leaves or needles of a tree collect the energy from the sun to produce sugar, or food, for the rest of the tree. These light and water needs are usually met naturally. Once a tree is established, it does not have to be watered on a regular basis. Depending on the species, trees can grow extremely tall, such as the California Redwoods. Other species might stop growing at a certain height, as many ornamental fruit trees do. Trees do not grow all over. Instead, they expand at the edges. Branches of a tree only grow from the tip and around the diameter. The same can be said of the trunk of a tree. Many species of trees, especially ornamental trees, need to be watched carefully for signs of rot or fungi. This will show up as curled leaves...or leaves with black or white spots on them. Rot and fungi can be treated with sprays, which can be purchased at any local garden center.